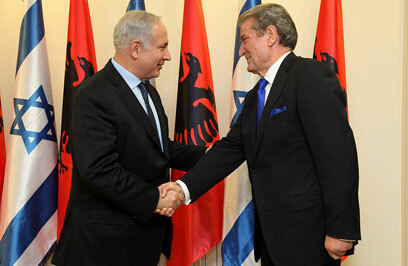 When Albanian Prime Minister Sali Berisha talks about Israel, one might mistake him for a Zionist leader who could easily fit into the Likud or Yisrael Beiteinu parties. But when these statements are made by a Muslim leading a moderate European Muslim country – they are definitely surprising. The highlight was at the United Nations General Assembly, after the famous clash between Prime Minister Benjamin Netanyahu and Palestinian President Mahmoud Abbas over the Palestinian statehood bid. When it was Berisha's turn to talk, he openly criticized the Palestinian move. His General Assembly address did not exactly benefit Albania's relations with Muslim countries, especially Iran, but he refused to take it back. "Iran and its leader, (President Mahmoud) Ahmadinejad, are the new Nazis, and the world must learn from the Holocaust and stop them before it's too late," Berisha says in an interview to Yedioth Ahronoth. "The Holocaust taught the free world's conscience not to let such a scenario repeat itself." When asked if Albania, as a NATO member, will join a military strike against Iran if and when such a decision is made, he immediately replies: "We'll support such a move and join it, just like we supported the operation in Libya. It won't be against the Iranian people, but against the nuclear facilities." It's no wonder that during his recent visit to Israel, his third, Berisha held meetings with the president, prime minister, Knesset speaker and foreign minister, and was praised for his courageous opinions. Foreign Minister Avigdor Lieberman even informed him of his decision to open an Israeli embassy in the Albanian capital of Tirana. Berisha did not settle for these meetings and even visited the Western Wall, where he received a blessing from the holy site's rabbi, Shmuel Rabinovitch. He didn't visit the Temple Mount mosques. Why did you oppose the Palestinian UN statehood bid? "The unilateral Palestinian move does not advance a political solution, but sabotages the peace process. The attempt to bypass Israel and the US is a mistake. Peace between Israel and the Palestinians must go through direct negotiations and by guaranteeing the security of both states. Shortcuts will do no good." Were you pressured by Arab countries or Iran because of your stance? "We are in no way against the Palestinians. Whoever says that is completely wrong. But we have our own opinion, and we believe it's the right way. Some countries, which have pushed the Palestinians to take radical steps, have taken an unacceptable stand against Israel. The solution must bring full security to both states, but I have not seen any support for the acceptance and recognition of the State of Israel." Will you vote against a unilateral recognition of a Palestinian state at the UN General Assembly? "We have yet to decide whether to abstain or vote, but we definitely won't vote in favor." What is your stand regarding the Iranian threat? "A nuclear Iran is the biggest threat to peace in the Middle East and in the entire world. It's not just against Israel. The latest IAEA report showed that Iran is working to acquire a nuclear weapon and won't allow its facilities to be supervised. The Security Council must take all steps necessary to prevent a nuclear Iran." If diplomatic efforts fail and Iran acquires a nuclear bomb, will you support a military strike on Iran by NATO? "We'll support any NATO decision." And if Israel decides to attack? "I believe it has to be coordinated. At the moment there is an international document, and the best way is through Security Council resolutions." You must have supported the Arab Spring. "Regimes based on religion have no future. Those who protested on the streets in Arab countries were fighting for freedom and values shared by all human beings, regardless of their religion. Western countries must reach out and help them build their democratic institutions." Is Albania a good example of how a moderate Muslim country should look like? "Albania is a country of religious tolerance. We are a multi-religious country. The majority of the population is Muslim, but never in our long history have we had inter-religious incidents. Religion has no influence on politics." Israelis have stopped traveling to Turkey because of the crisis, and many are going to Greece and Bulgaria instead. Perhaps they should come to Albania. "I believe Israeli will return to Turkey, but they're more than welcome in Albania. In the past year we have seen a significant increase in the number of Israeli tourists. This year we were picked by Lonely Planet as the No. 1 tourist destination, and we have a lot to offer Israeli tourists. "In general, many Israeli companies invest in Albania, and I call on Israelis to continue doing business with us." See all talkbacks "Albanian PM: Ahmadinejad is the new Nazi"